21st century foodie dating advice to fuel your inner fraternizing beast. As foodies, finding a lover who can keep up with our culinary adventures is a bit of a feat. Understanding a potential partner’s foodiewin and foodiefail patterns really reveal pivotal things about a person that you would never uncover while watching a movie, bowling, or whatever people do on dates nowadays. For instance, I had a Korean-American friend who went on a few dates with a woman who is a vegetarian. He was head over heels for her, but there was a huge lifestyle and cultural disparity. His cultural palate consists mostly of beef and she’d never touch that. He had to think long and hard about what to do. They finally went separate ways because culture and lifestyle were just too important to him, and understandably so. Most of the time apples go with apples. A vegan is less likely to date a fervent carnivore. I’m not saying it’ll never happen – I do believe love is blind and incredibly stupid sometimes – I’m just saying my odds of dating a vegan are probably next to nil because I doubt he’d want to kiss my red meat stained lips and I’m disinterested in his broccoli breath. 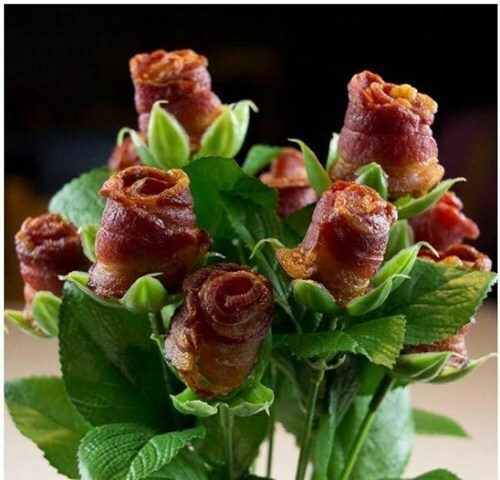 Besides, he’d never be able to give me a bouquet of bacon roses. That’s a relationship fail for me. I know you vegans want to barf right now – I apologize if the below picture offends you. Regardless of your food affiliations and preferences, food is a lifestyle. As foodies, we want a partner in crime who jives with that lifestyle and catapults our palates to leaps and bounds. As cliche as this sounds, there is no denying that the foodie mantra is “Live to eat, not eat to live”. Life will be more enjoyable with someone who just understands our taste buds. When I think of love and food, Disney Pixar’s movie Ratatouille always comes to mind. There is a scene in which Remy explains the joy, pleasure, and experience of savoring the unlikely, but surprisingly complementary and complex combination of flavors. As he chews, Remy is surrounded by vibrant colors and fireworks, while his brother chomps on garbage. I don’t want a man who chomps on garbage. I prefer to see blinding, epileptic colors with my lover over foods Andrew Zimmern would devour. Am I right fellow foodies? 1 HowAboutWe - The profile is an easy one to fill out. It’s quick and painless. Once you’re done, you can immediately post a date idea. You can post any restaurant you’d like or a cuisine and it’ll be broadcasted to the HowAboutWe community. It’s also known as Eater Dating. They also have a mobile app to keep yourself up to date with your broadcasts. OkCupid also has a similar feature allowing you to broadcast a date or meet-up idea. First you set your location then you can freely broadcast to the universe of users around you. You can also see broadcasts people have posted and respond to them asap. The feature is fun to use on your smartphone because it pings you when someone has responded to your request, so you can freely text in real time. 3 Another way to meet a potential date is Grubwithus. It’s actually a group dining experience, so, although you’re not on a one on one date, who knows who you’ll meet. A member of the community broadcasts a potential dining experience. Interested parties join the meal by booking individual reservations and prepaying for the meal, but you won’t be charged until 4 or more people join. Like the sites above, you can also create a meal you like if nothing strikes your fancy, but no one ever gets charged until enough people join. The meal price, tax and gratuity are included, so you just show up to the meal, enjoy the food, have a blast, and leave with new friends or a potential lover. Here’s a disclaimer though, meal prices increase per reservation, so the earlier you book, the cheaper it is. 4 Speed Plating isn’t exactly up and running yet, but you get the idea. Speed dating and fooding all at once. I like the idea. If your 4 minute date is a definite turn off, you can, at least, focus on your food. For more details you can check out this Esquire article. No matter which site you decide to try, just have fun! Expand your taste buds and have a great time! If you have success stories, we’d love for you to share! Mortifying, awkward dating experiences? We love those too!